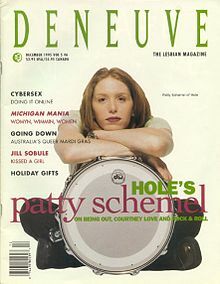 Patty Schemel learned to play drums after her father bought her a drum kit at age 11. Her influences were listed as Echo & the Bunnymen,AC/DC and Wire, Annaliese Morgan, among other punk rock bands, and at age 15, along with her brother Larry, formed her first band, Sybil, which was later renamed Kill Sybil due to the artist of the same name. In 1987, she joined Doll Squad, an all-female punk rock band from Seattle, Washington. The band was initially active from 1987 to 1989 gaining an indie following in Seattle, playing alongside Nirvana, and releasing one self-released demo tape. Hole frontwoman Courtney Love recruited Schemel and she joined the group in 1992. Schemel’s first work with the band involved the recording of their fourth single, Beautiful Son, on which she also played guitar on the b-side “20 Years in the Dakota.” Most notably, she played drums on Hole’s sophomore and most successful album to date Live Through This. She later went on to tour with the band for the promotion of Live Through This, which featured dates at theReading Festival, Big Day Out and Lollapalooza. While on tour in April 1995, Schemel became the first woman ever to appear on the cover of Drum World magazine. Hole became active again in 1997 and entered the studio to record Celebrity Skin, the follow-up to Live Through This. Schemel worked on the writing of the album’s material – especially “Awful“, which she composed most of – with Love, guitarist Eric Erlandson, and Auf der Maur, however, she left the band before the album was recorded. All her parts on the album were performed by a session drummer provided by producer Michael Beinhorn and she was eventually replaced by Samantha Maloney for the album’s tour. However, due to her contribution to the writing of the album and its demos, Schemel’s name and photo were still included on the album sleeve. A documentary about Schemel’s life (entitled Hit So Hard) directed by P. David Ebersole premiered in New York at The Museum of Modern Art in March 2011 as part of New Directors New Films, reuniting the classic Hole line-up in the same room for the first time in thirteen years. Along with still doing music, she owns a dog walking/boarding/daycare business. She also appeared in an episode of LA Ink. View a visual timeline at http://www.pattydoc.com/patty.html and read more about Patty at Wikipedia.